I realy like the colours of your sampler : very soft and pleasing to the eye. Have fun with the new projects and the children ! Your Old Sampler looks beautiful Sachiko! I am almost finished stitching Part 7, and I am also very happy when I stitch this sampler. I will be sad when it ends, but I will be very happy to have such a beautiful sampler! Enjoy your work with the children! 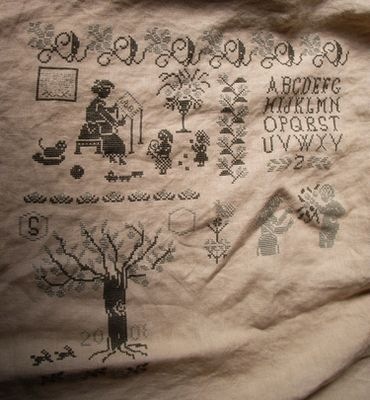 beutiful sampler, i like the litle bunnies. You’ll never regret the time you spent doing things with and for your children. I have to say, now that my son is grown up, I miss doing some of those appointments. They were great fun. You stitching is lovely. What a beautiful color. Its nice to involve and participate with our children activities, especially in their growing-up years. You are doing great! 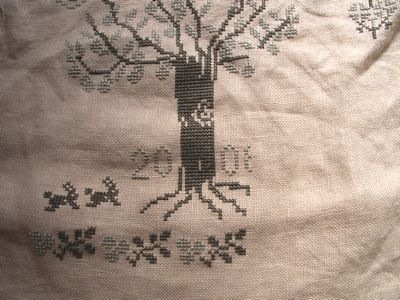 Great progress for your sampler, the tree is blooming. Your Old Sampler is looking so pretty. I just love the colours you’ve chosen for it. It’s looking great Sachiko. I have yet to stitch part 7 but I’m excited to start with it soon. What a lovely sampler, isn’t it? It’s very, very nice ! An outstanding share! I’ve just forwarded this onto a friend who has been doing a little homework on this. And he in fact ordered me dinner because I found it for him… lol. So allow me to reword this…. Thank YOU for the meal!! But yeah, thanks for spending the time to talk about this matter here on your web site.